High-King Elrond In the final years of the First Age, when the conquest of Beleriand by Morgoth was all but complete, the Valar sent a great host to defeat the Dark Lord once and for all. Their victory, however, was dearly-won, for in the violence and tumult of the War of Wrath, the lands of Beleriand were destroyed and lost beneath the waves of the sea. Of the Noldor who survived and the Sindar who followed them, those who yet desired to remain in Middle-earth followed Ereinion Gil-galad to Lindon. 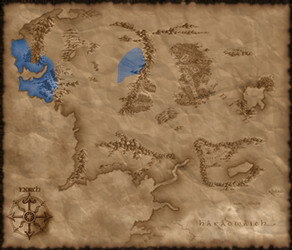 There, they built Mithlond, the Gray Havens, and the twin harbors of Forlond and Harlond.Others of the Noldor, led by Celebrimbor, continued eastward into Eriador and established the realm of Eregion. It was here that Sauron, lieutenant of Morgoth, approached the elves in disguise. Under his deceitful guidance, the elves crafted the Rings of Power, of which the Three Rings of the Elves were the fairest and greatest. But when Sauron crafted in secret the One Ring to dominate all of the other Rings of Power, the elves perceived his true nature and hid away the Three. Realizing that he no longer held sway over the elves, Sauron moved quickly, destroying Eregion and slaying Celebrimbor. Those who survived the fall of Eregion fled to the east, where -- under the leadership of Elrond -- they established the refuge of Imladris, Rivendell, in the foothills of the Misty Mountains.With the assistance of men from Númenór, the elves were able to drive Sauron back to Mordor, andfter a seven-year siege upon the fortress of Barad-dûr, the Last Alliance of Elves and Men were able to defeat him and scatter his forces. However, the power of the Noldor was greatly diminished. Many, including Gil-galad their king, were slain, and most of those who survived decided to end their long exile in Middle-earth and return to the Undying Lands across the sea.Today, the realms of Mithlond and Imladris have but a whisper of their old glory, and they no longer have the strength or numbers to march openly again against the resurgent power of Mordor. Yet the valor of the elves has not diminished through all the long ages of Middle-earth, and by their vigilance the lands east of the Misty Mountains are yet kept safe from the shadows growing again in the East. A fearless heavy cavalry general's bodyguard. Relies on highly skilled archers and infantry.